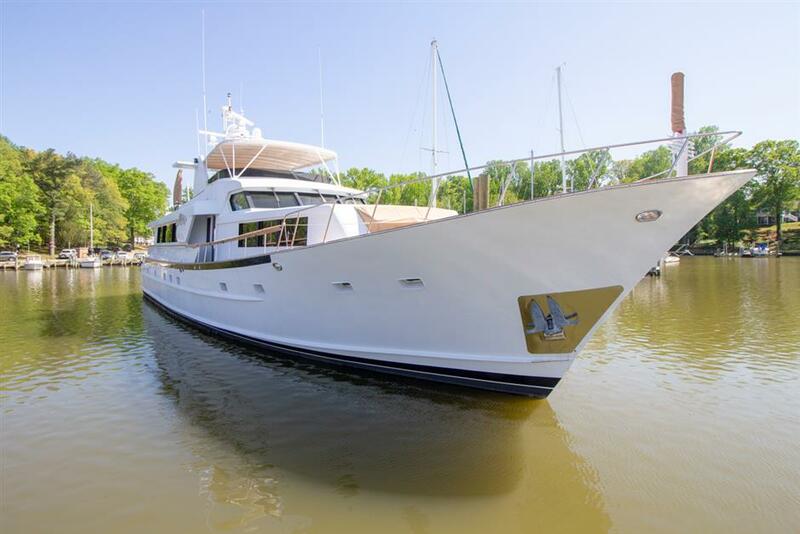 102' Broward "Liquidity," is the ideal yacht for entertaining! 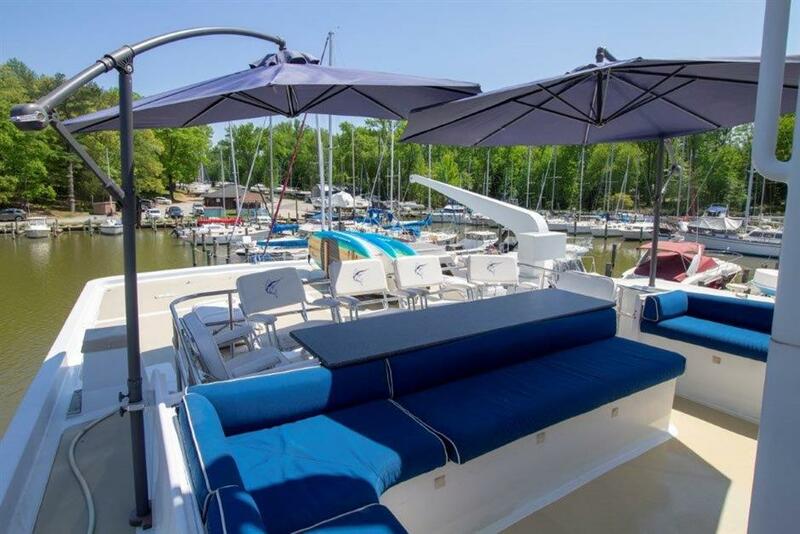 : Atlantic Yacht & Ship, Inc.
102′ Broward “Liquidity,” is the ideal yacht for entertaining! 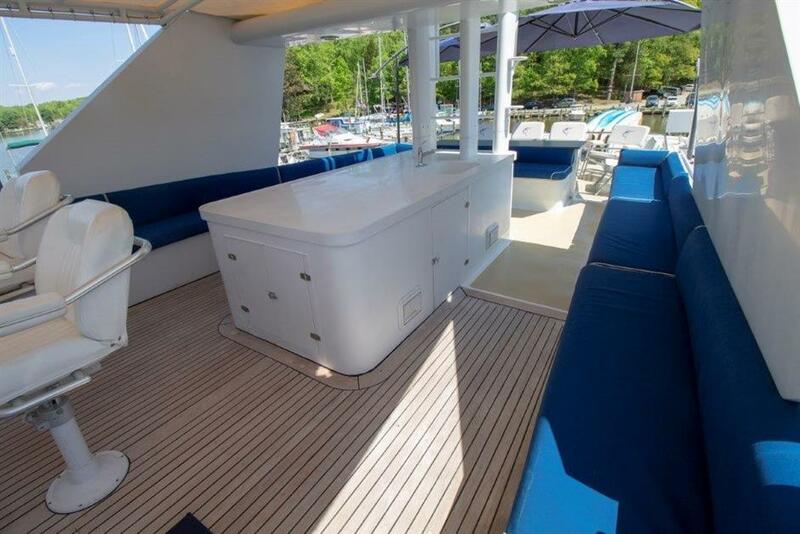 The aft deck is a large popular space to relax, observe and converse. Low profile aft weatherboard with stainless railing and entrance doors. 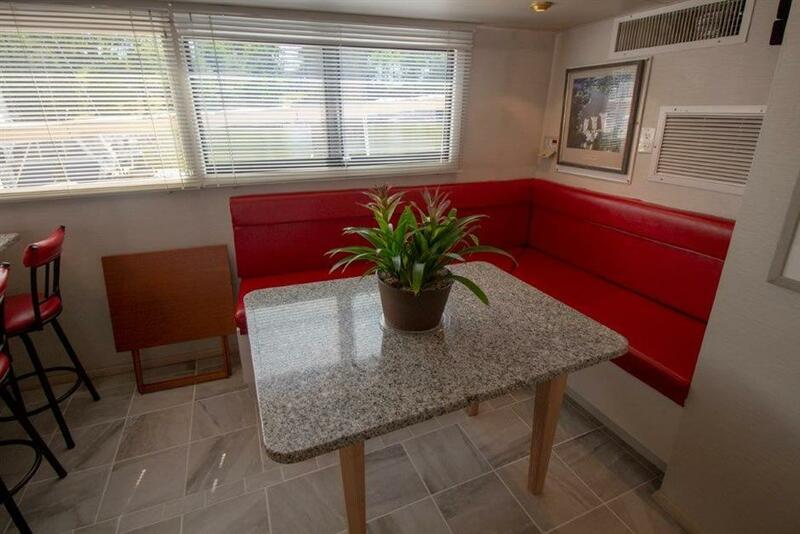 Built in bench seating with dining table, chairs and lounges. Stairways lead down to the swim platform and large storage lazarette. Tide-rise stairway leads down to the dock. 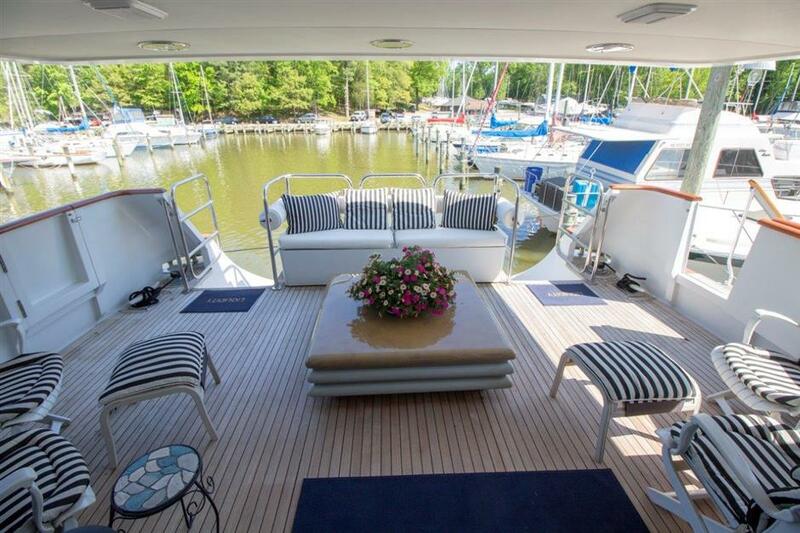 The flybridge and boat deck are reached by stairs up from the pilothouse. Protected under a sturdy Pipe Welders aluminum framed soft top and Bannenberg styled radar arch. A centered helm with desired remotes with new Simrad display and twin Besenzoni helm chairs. There is bench seating for twenty or more guests. In addition, centered is an island with refrigerator, sink, storage and mast for antenna. Equipped with twin electric davits to launch and retrieve tender. Coupled with two cradles for jet skis, two life rafts in storage for paddle boards and two umbrellas aft. 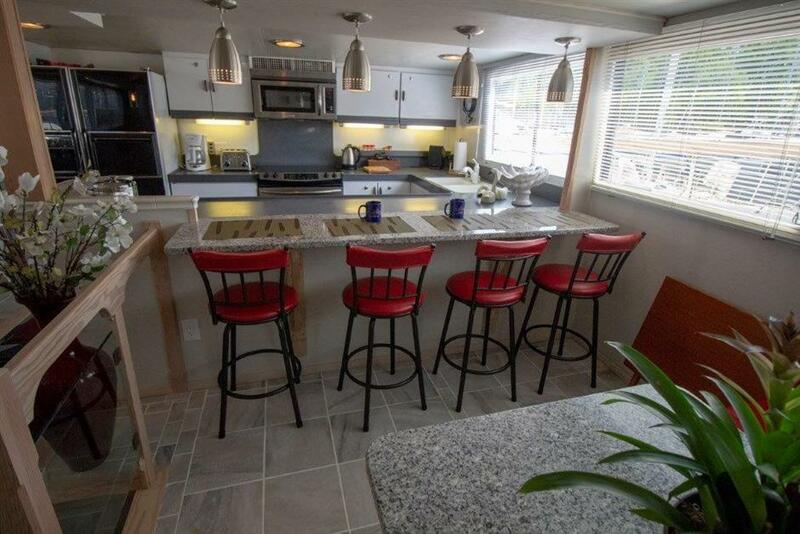 Dining for up to eight is at the varnished round table which is across from a full wet bar with sink, refrigerator, icemaker and excellent storage. The panoramic views continue during dining due to the huge Bannenberg styled windows. A impressive detail is the varnished teak and holly floor in the dining salon. For more information about the 102′ Broward “Liquidity,” please contact the Atlantic Yacht & Ship sales professional Stephen Faraldo at 561-322-8279. New to the market! 40′ Azimut 2013 located in Key West! Considering selling your yacht or boat? List with Atlantic Yacht & Ship, Inc.